The Grumman A6 Intruder is an all weather, low-altitude, carrier-based attack plane. The A6A primarily flew close air support, all-weather and night attacks on enemy troop concentrations, and night interdiction missions. Its advanced navigation and attack system, known as DIANE (Digital Integrated Attack navigation Equipment) allowed small precision targets, such as bridges, barracks and fuel depots to be located and attacked in all weather conditions, day or night. The planes were credited with some of the most difficult single-plane strikes in the war, including the destruction of the Hai Duong bridge between Hanoi and Haiphong by a single A6. Their missions were tough, but their crews among the most talented and most courageous to serve the United States. 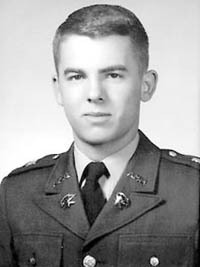 Captain Ralph J. Chipman was the pilot of an Intruder assigned a mission over North Vietnam on December 27, 1972. His co-pilot on the flight was First Lieuenant Ronald W. Forrester. The aircraft did not return from the mission, and last contact was made with the crew over the target area. A subsequent article in Quan Doi Nhan Dan, a daily Vietnamese newspaper described an aircraft downed by the Vietnamese. Apparently the pilot was reported to be dead, and possibly the co-pilot as well. Although this article was thought to possibly relate to Chipman and Forrester, it was not definite enough for proof of death. Both men were classified Missing in Action. memorial marker for Karoni’s father, Ronald Wayne Forrester, in Arlington National Cemetery last year. Karoni Forrester Gonzales grew up knowing her father through photos and friends — because that’s all she had. U.S. Marine Captain Ronald Wayne Forrester, an Ector High School graduate, was officially listed as Missing in Action on December 27, 1972, during the Vietnam War — when his little girl was only 2 years old. She’s 36 now. He’s also MIA. According to the Permian Basin Vietnam Memorial Web site, Forrester is the only military man from Ector County who has never been accounted for. Chairwoman of the National League of Families Publicity Committee, Gonzales is flying today to Hue, Vietnam, to meet diplomats and examine a crash site excavation. The small delegation accompanying her is an effort to increase cooperation with foreign intelligence in hopes of finding answers for the 1,788 U.S. soldiers still missing. The 16-day trip will include visits to Laos, Vietnam and Cambodia through courtesy visas. Jana Forrester Bland, the former wife of the missing Marine, said she personally experienced the grief and questions of knowing an MIA soldier when the co-pilot’s plane went down in North Vietnam. Forrester and the pilot, U.S. Marine Captain Ralph Jim Chipman from Orem, Utah, were listed as MIA. Their remains have never been recovered. Through her POW/MIA activity in the National League of Families, Gonzales has been involved with the U.S. Department of Defense in resolving unsolved cases and identifying missing remains. Gonzales said more than 750 MIA remains have been identified since the war, and she hopes the trip to Vietnam will produce more through the excavated crash site there — even though it may not shed light on her father’s whereabouts. “It’s the same type of aircraft that my dad was flying, but it’s a little farther south of where he crashed,” she said. Gonzales has followed her father’s footsteps through Odessa, by attending Texas A&M University and now by heading to Vietnam, but she said her trip holds more than a personal nostalgia.